Text and addition Information on the Compulsory License for Antiretrovirals issued September 21, 2004 in Zambia. Page U.S. - South African Customs Union Free Trade Agreement. July 7, 2005. Andrew Jack for the Financial Times. Malawi hopes to make Aids drugs. June 10, 2003. Note from Delme Cupido from Namibia's Legal Assistance Center (followed by a news story). Namibian firm will produce AIDS drugs. August 26, 2002. Declaration of Action. August 28, 2002. Press release. Pan-African HIV/AIDS Treatment Access Movement (PHATAM) Launched. August 31, 2002. Adele Baleta for the Lancet. New African movement for HIV/AIDS patients launched at Summit. March, 2002. Nigeria begins its pilot antiretroviral program, using imported generic drugs from India at a cost of USD 350 a year. The program was supposed to start last and treat 10,000 to 15,000 people, but there were problems implementing it, and it now treats 8,000. For more i nformation on the program, see the CPTech page on Nigeria. August, 2001. Ugandan pharmaceutical firms apply for compulsory licenses for antiretroviral drugs, including AZT and 3TC. The Ministry of Health has not issued a license, citing quality concerns. See the Business Day story, Local HIV Generics Bid Rejected. July 25, 2001. Statement by the Africa Group. TRIPS and Public Health Informal Session. June 24, 2001. Kenya passes new, TRIPS-compliant legislation aimed at increasing access to medicines. See the CPT Page on Kenya. March 16, 2001. Botswana annouces that it hopes to provide ARVs by the end of the year, most likely by taking advantage of Cipla's offer to provide tripple combination therapy to governments for US$600 per patient per year. On March 5, the the court case brought by 39 pharmaceutical companies against the government of South Africa began. On March 6, 2001, the judge allowed, at the request of the plaintiff, the trail to be postponed until April 18. For more information, see CPT's page on South Africa. A number of pharmaceutical companies have offered discounted HIV/AIDS drugs to African countries, usually on a country-by-country, drug-by-drug basis. See the CPT page on offers of price reductions for HIV/AIDS drugs. Text of the USTR Special 301 Report (in pdf format) on which Egypt in included in the Priority Watch List. See page 18. May 14, 2001. Heba Kandil for Reuters. Egyptian firm ready to make AIDS drug. May 14, 2001. Australian Broadcasting Company. Egyptian company to produce low-cost AIDS and leukaemia drugs. 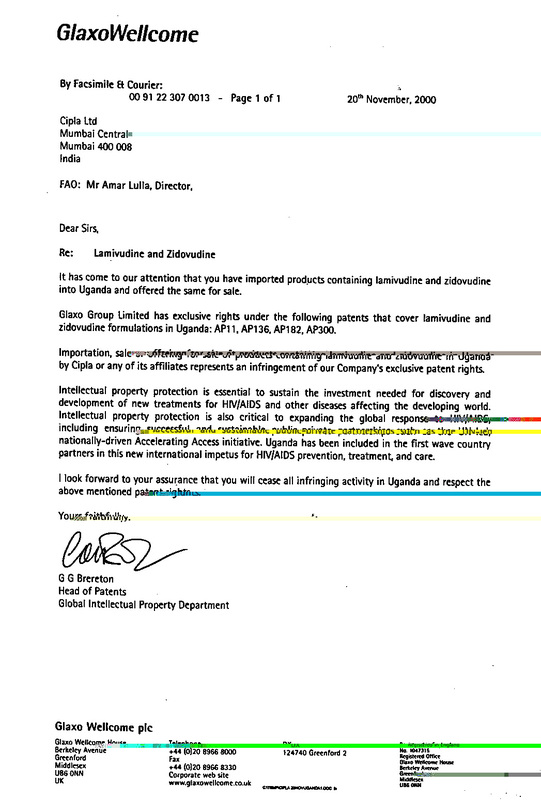 November 20, 2000 Letter from GlaxoWellcome to CIPLA regarding CIPLA's export of Duovir to Uganda. Here is a jpeg image of the letter. December 19, 2000 Letter from CIPLA to Glaxo replying to above letter. This report provides important background information on the African Regional Industrial Property Organization (ARIPO). Currently, Botswana, Gambia, Ghana, Kenya, Lesotho, Malawi, Mozambique, Sierra Leone, Somalia, Swaziland, Sudan, Tanzania, Uganda, Zambia and Zimbabwe are all member states of ARIPO. According to this report, "Nigeria and South Africa are in the process of negotiating their accession to ARIPO." Response by OAPI to MSF and UNAIDS recommendations that Member Countries not sign the revised Bangui Agreement. Currently, Benin, Burkina Faso, Cameroon, The Central African Republic, Chad, Congo, C�te d Ivoire, Gabon, Guinea, Guinea Bissau, Mali, Mau ritania, Niger, Senegal, and Togo are all member states of OAPI. Information Memo on the Enforcement of the Revised Bangui Agreement. February 6-10, 2000, Pascale Boulet, MSF/WHO/UNAIDS, New West African patent agreement: countries urged to consider potential negative impacts before ratifying. April 11, 2000, James Love, letter to Senator Roth, Senator Feinstein, Senator Feingold, Representative Hastert, and Representative Rangel expressing opposition for a compromise on the Feinstein/Feingold amendment to the Africa trade bill. H.R. 1432 African Growth and Opportunity Act (Passed by the House) in the 105th Congress. The provisions in this bill on Intellectual Property were fairly general. Benefits of US aid and trade programs would be linked to the establishment or "continual progress toward . . . a market-based economy" that is defined in many ways, including the protection of intellectual property. Examples of other criteria are minimizing the use of price controls, supporting the growth of the private sector and privatization of government enterprises, to mention a few. The legislation also considers if the country is or is seeking membership in the WTO, which would make the TRIPS apply. This legislation remains controversial and will be considered in the 106th Congress. February 28, 1999, CPT note on Section 601 (the TRIPS provision) in Jesse Jackson, Jr's HOPE for Africa Act, HR 772. Public Citizen's page on African Trade legislation. Lopsided Rules of North-South Engagement: The African Growth and Opportunity Act, South Centre, Geneva Switzerland. On February 20, 2001, the Bush administration announced that it it was "not considering a change in the present flexible policy" on medicines for HIV/AIDS in poor countres. There had been speculation that Bush might reverse Executive Order 13155. This is the executive order issued by Clinton onMay 10, 2000, which forbids the U.S. Government from seeking TRIPS-plus protection for HIV/AIDS drugs in sub-Saharan African nations. Bush has stated that he intends to review many of Clinton's executive orders. February 20, 2001. US Trade Representative Statement on HIV/AIDS and Trade Policy. Text of executive order 13155 from GPO, or from CPTECH site. January 30, 2001. USTR-appointee Zoellick's comments on executive order 13155 at his Senate confirmation hearing. January 26, 2001. Letter from 29 U.S. Representatives to President Bush regarding Executive Order 13155. Developing-World-Bioethics.com This site is primarily designed to supply you with professionally evaluated information about ethical, legal and social issues (ELSI) of HIV/AIDS in the developing world, with a specific focus on Southern Africa and the rest of the continent. January 9, 2003. Victor Youmbi for Open Democracy. The WTO, or how patenting crushes Africans - From Cameroon, a passionate cry of protest against the global intellectual property system that holds African citizens in the chains of poverty. April, 2003. Online petition for generic access in the Ivory Coast. January 8, 2002. Health Development Networks. Thai Strategy for Generic Drugs to Africa. December, 2001. Network of African People Living with HIV/AIDS. Recommendatins to the International Conference on AIDS and STDs in Africa. Newshour with Jim Lehrer Online. AIDS in Africa: A Health Spotlight Special Report. A collection of stories from 2000-2001, and statistics. June 8, 2006. Tatum Anderson for BBC News. Africa rises to HIV drug challenge. November 6, 2003. BBC. Mozambique to get Aids drug plant. July 3, 2003. Ghana Web News. Ministry Of Health Orders HIV/AIDS Drugs. April 22, 2003. UN Integrated Regional Information Networks. BURKINA FASO: Cheaper Drugs From India for People With HIV. April 15, 2003. UN Integrated Regional Information Network. ETHIOPIA: Anti-HIV/AIDS drugs to be produced locally. February 28, 2003. Mark Hamata for the Namibian. MP Argues Case for Free Drugs for Aids. December 2, 2002. Michael Grunwald for the Washington Post. A Small Nation's Big Effort Against AIDS. September 30, 2002. New York Times Editorial. A Nation Facing Disaster. July 4, 2002. South African Press Association. GSK denies milking Africa. December 22, 2001. Manoah Esipisu for Reuters. Zambia's Tembo Promises Cheaper AIDS Drugs. Decmber 19, 2001. Cristof Maletsky for the Nambian. HIV/Aids Drug Delay Slammed. December 15, 2001. Kyodo News. Botswana seeks Brazilian aid to fight AIDS rampage. December 7, 2001. Salih Booker (Director fo Africa Action) in the Seattle Post-Intelligence. AIDS pandemic threatens planet. September 28, 2001. The Economist. Namibia OKs Nevirapine. September 24, 2001. Paul I. Ojeogwu and I.M. Nwaedozie for the Daily Trust. African Day for Technology And Intellectual Property Rights. August 8, 2001. UN Wire. Ethiopia Reaches Deal With Firms To Import Cheap Drugs. August 2, 2001. Jesse Pesta and Mark Schoofs for the Wall Street Journal. Feild Tests of Generic AIDS Drugs in Africa, India May Effect Millions. June 26, 2001. Joachim Mwalongo for the Tomric News Agency. Tanzanian Company Vows to Produce Anti-AIDS Drugs..
June 13, 2001. Douglas Farah. Washington Post story reprinted in the International Herald Tribune. Africa's Woes Limit Reach of AIDS Drugs. June 13, 2001. Editorial by Roger Bates for the Wall Street Journal. AIDS Has no Cure - Remember? June 11, 2001. Bob Herbert op-ed in the New York Times. Refusing to Save Africans. May 21, 2001. New Vision. Government to Offer Free AIDS Drugs to Pregnant Women. May 14, 2001. John Donnelly for the Boston Globe. Hope, Despair Drive AIDS Fight in Nigeria. April, 2001. Chinua Akukwe and Melvin Foote for Foriegn Policy In Focus. HIV/AIDS in Africa: Time to Stop the Killing Fields. April 30, 2001. Barbara Crossettee for for the New York Times. Experts Say That Cheaper Drug Treatments Alone Are Not Enough. April 25, 2001. Grace-Marie Arnett for the Philadelphia Inquirer. AIDS Drugs Not Enough. April 24, 2001. Salim Ahmed Salim and K.Y. Amoako for the International Herald Tribune. Leaders Meet to Rally Africans Against a Plague. April 16, 2001. Reuters. Ethiopia Allows Import of AIDS Drugs for First Time. April 9, 2001. Anne M. Simmons for the LA Times. Cheap Drugs Are Only Part of Weapons Against AIDS. April 4, 2001. Reuters. Cameroon signs up for cheap AIDS drugs. April 4, 2001. Opinion column by Arthur Kaplan for MSNBC. Cheap drugs not answer to African AIDS crisis. April 4, 2001. Naomi Koppel for the Associated Press. Drug Federation Defends Prices. April 4, 2001. Osman Benk Sankoh And Sulaiman Momodu for the Freetown Concord Times. War Against Aids: Government Makes Arrangement for HIV Treatment Drugs. April 4, 2001. Huntly Collins and Susan Warner for the Philadelphia Inquirer. Massive new effort to combat African AIDS is planned. April 4, 2001. John Donnelly for the Boston Globe. Now what? March 27, 2001. Panafrica News Agency. Renamo Demands Anti-retroviral Drugs. March 25, 2001. Denise Gellene in the LA Times. AIDS Drug Pricing Controversy Opens Door to Wider Debate. March 25, 2001. Tom Abate for the San Francisco Chronicle. Drugmakers Yield to Pressure: Multinational firms offer tiered pricing for life-saving medications. March 22, 2001. Editorial in the Boston Globe. AIDS breakthrough. March 22, 2001. Editorial by Okey Ndibe for the Guardian. Africa's AIDS windfall. March 20, 2001. Baltimore Sun. Ivory Coast pioneer in getting low-cost HIV drugs. March 15, 2001. Steve Sternberg editorial in the USA Today. AIDS drug costs hurt Africa New discounts mean little in poor nations. March 12, 2001. Editorial in the Chicago Tribune. AIDS Drugs for Africa's Plague. March 12, 2001. Editorial in the New York Times. AIDS Drugs for Poor Nations. March 10, 2001. Sheryl Stolberg in the New York Times AIDS Drugs in Africa: If Cedes to When. Death Watch A series of articles on AIDS in Africa printed in the Washington Post throughout 2000. May 11, 2000, BBC Online, New hope in Aids fight. May 11, 2000, BBC Online, UN welcomes Aids drugs deal. May 11, 2000, Mark Sandalow, in the San Francisco Chronicle, Defiant Clinton Approves Cheaper AIDS Drugs for Africa. May 11, 2000, John Burgess, in the Washington Post, Africa Gets AIDS Drugs Exception. May 10, 2000, Lakshmi Chaudhry in Wired, About-Face on Africa AIDS Drugs.